Have rarely read stories that involved Love and affection. Never had I thought that would be so interesting. Having always loved fairy tale'ish fiction stories, I never thought I would actually like reading something that deals with the topic I always have ignored. Thanks to Blogadda, now I am leaping genre to genre. And oh, thank you for autographed copy ! This time, its all about love. But not just a regular mushy stuff. But an interesting plot one would have never heard of. 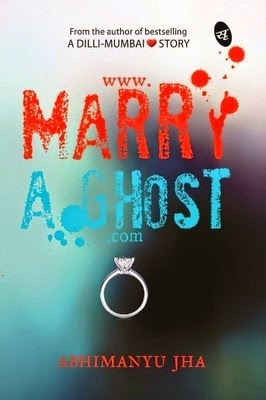 'www.MarryAghost.com' by Abhimanyu Jha is an interesting account of life of Veeru. A techie who runs failed startup and does freelancing along with his buddy. One day, they challenge each other and things end up as a matchmaking website for ghosts ! Yes, ghosts. To his surprise, the site has its first registration as well and that too by a ghost who is looking for her love that will help her find oblivion ! Add to this, a mysterious lady in her fifties, professor at a college, who can see and talk to ghosts. Proceedings go quite interesting way as the quest begins as Veeru and Maahi goes in search of the guy. From funny to mushy. Even, mysterious at places. The story proceeds pretty fast and that is actually a good thing for a story of this genre. Lead character Veeru is someone you may love to fall in love with. The way Jha describes him, the carefree young lad falling in love with Maahi-the ghost. And Maahi, the lovely lady - whose search for her lover forms crux of the story - is equally an interesting character. The angle of mystery attached with the storyline keeps you glued to it. How the dream of Maahi is decoded, how Maahi meets a mysterious character which leads to more questions. And above all these, the lady in question. Professor lady. All of this creates interesting mix for this search. Equally, the lovelorn character of Maahi makes you want to believe her pain. Though Maahi and Veeru's conversations are occasionally fun and occasionally endearing. Still, I felt there is something missing there. Something, that could have been better. Sometimes the attachment of the two, seems fragile, because of the peppy things maybe? Or, the writer has done so for a purpose? Another thing I wasn't much comfortable with, is the style of monologue'ish story telling. Turn by turn we get to hear encounters with the eyes of Veeru and Maahi. To certain level, its well done. But sometimes, the scenes get recreated when another character tells it from their angle. It seems duplicated and overtly long. Similarly, the tale of Marquis' flashback, gets into too much detail, almost irritating. Again, is that done for a purpose? Who knows. Given all those grudges,I would say this one is really an interesting tale. Dashed with one of my favorite genre (ghosts !!) Abhimanyu creates a really interesting storyline that keeps you glued and wanting to know what will happen next. Why the things happen this way with Maahi and who is the professor. Occasionally fun moments add relief to serious on-goings. And without being too literary mushy, you can feel the love. Love of Maahi and Veeru. I would recommend this to lover of both genres. Romantic and Horror. Not actually a 'horror' story is this, but it charmingly merges both worlds together.